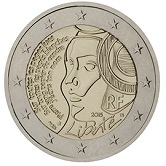 France was one of the founding members of the Euro zone and started issuing coins in 2002. 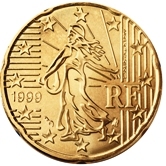 French Euro Coins - particularly the Commemoratives - provide a wealth of information regarding French history and famous Frenchmen, past and present. Some basic facts relating to France. 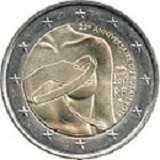 Three motifs are used for French Euro Coins - one for the "copper coloured coins"(1 cent, 2 cent and 5 cent), one for the "gold coloured coins" (10 cent,20 cent and 50 cent) and finally one for the one Euro and two Euro coins. 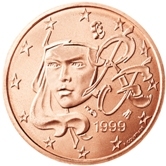 The first motif (1,2 and5 cent coins) is a young Marianne with a determined look who symbolizes a strong lasting Europe. 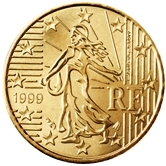 The second motif (10,20 and 50 cent coins) shows a sower before the rising sun - she gives a sense of continuity, having been long associated with the old French Franc and appearing on previous French coins and stamps. 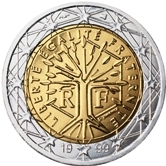 The third motif (1 and 2 Euro coins) is a stylized tree appearing in a hexagon and represents life and growth. The words "Liberté,Egalité,Fraternité"(Liberty,Equality,Fraternity) - the motto of the French Republic since the revolution also appear. 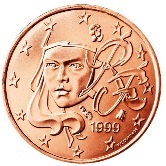 1 cent - Marianne symbolizing a strong lasting Europe. 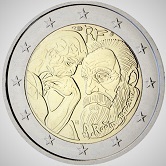 2 cent - Marianne symbolizing a strong lasting Europe. 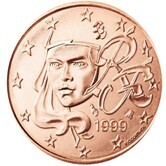 5 cent - Marianne symbolizing a strong lasting Europe. 10 cent - Sower before the rising sun. 20 cent - Sower before the rising sun. 50 cent - Sower before the rising sun. 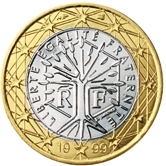 1 Euro - A stylized tree representing life and growth. 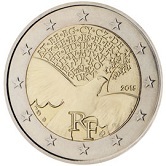 2 Euro - A stylized tree representing life and growth. 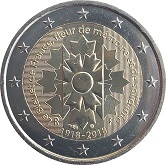 French Commemorative Two Euro Coins. 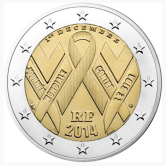 France delayed for quite a while before issuing commemorative coins but has made up for the delay by issuing 4 very attractive coins that gladden the collector's heart! 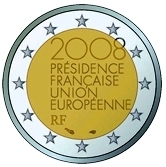 2008 - French presidency of the European Union for 2008. 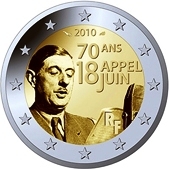 2010 - 70th anniversary of de Gaulle's appeal to the French to continue the struggle against the Nazis. 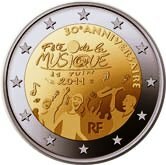 2011 - 30th anniversary of the "Fête de la Musique"-Every summer solstice since 1981 France has celebrated a "Day of Music". 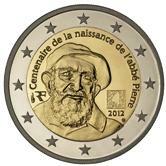 2012 - 100th birthday of Abbé Pierre - a popular catholic priest who founded the charity organization Emmaus. 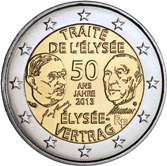 2013 - Joint issue with Germany, commemorating the Treaty of Élysée. 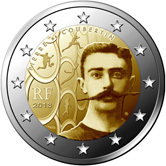 2013 - 150th birthday of Pierre de Coubertin. 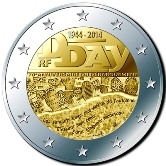 2014 - 70th Anniversary of the Allied Landings in Normandy. 2014 - World Aids Day. 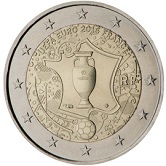 2016 - French hosting of the European football championship. 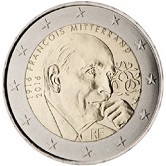 2016 - 100 th Anniversary of the birth of Francois Mitterrand. 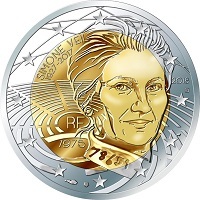 2018 - In honour of Simone Veil - a leading figure in the women's rights movement in France. 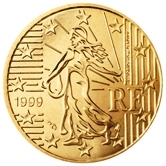 Return from French Euro Coins to Links to Specific Countries. Return from French Euro Coins to euro coin collector.